To conclude our Clip Art series, I bring you a special interview with Italian artist Pietro D’Angelo. Most people who make little paper clip sculptures often make them out of boredom at school or at the office, not Pietro though. 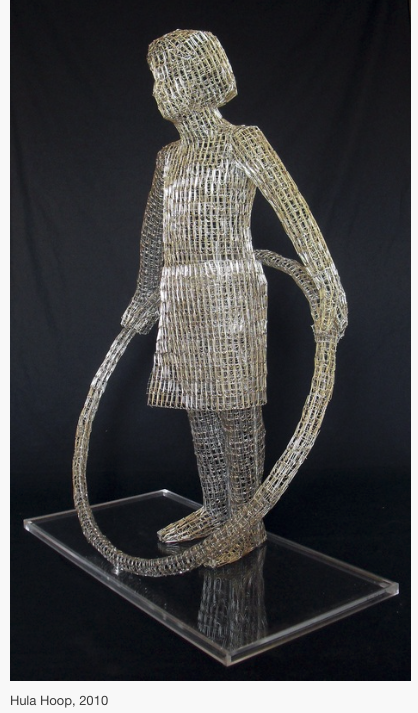 He makes very large and exquisite paperclip assemblage art with much passion and delight. 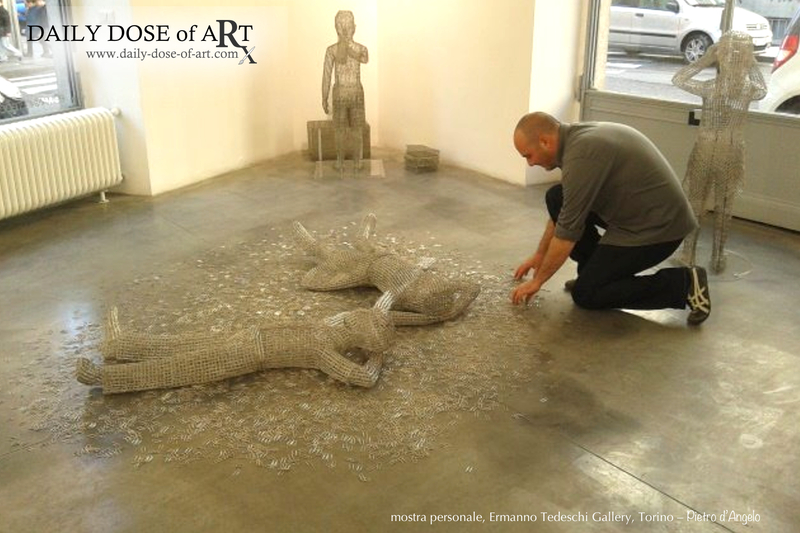 From his website, I’ve learned that Pietro D’Angelo was born in 1974 in Palermo and that he started his artistic adventures when he was only 12 years old by frequenting a sculptor’s studio in his hometown to learn techniques in terracotta, resin and bronze. Special thanks to Joel Lee for translating the interview questions to Italian and Pietro’s responses to English. Now you get to read the interview in both Italian and English. DDoA: Come un scultore, quali materiali hai adoperato? As a sculptor, what materials have you worked on? PdA: Inizialmente ho adoperando materiali tradizionali come argilla, gesso, resina e marmo. Poi durante gli anni dell’accademia a Bologna, ho iniziato a sperimentare nuovi materiali e ad utilizzare nuovi oggetti come bottoni, puntine da disegno, viti e graffette. I started out using traditional materials like clay, plaster, resin and marble. Then, while at the Fine Arts academy in Bologna, I started to experiment with new materials using new objects like buttons, thumbtacks, screws and paper clips. DDoA: Dove hai preso l’ispirazione di usare graffette per le tue scultore? 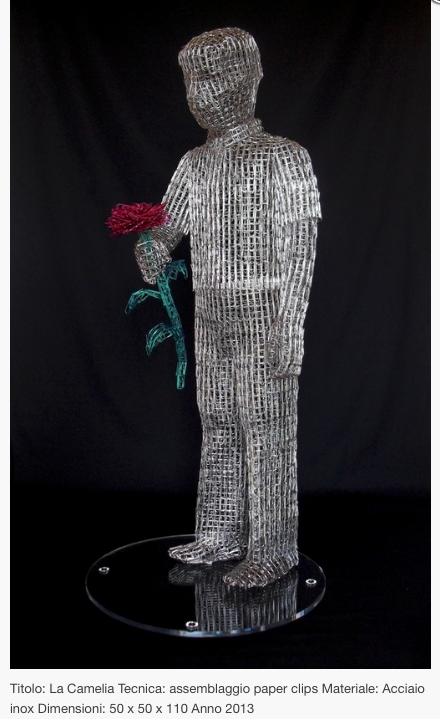 What inspired you to use paper clips as a medium for your sculptures? PdA: L’Incontro con le graffette è stato casuale. Quando vivevo a Bologna, abitavo sopra ad un negozio di articoli per ufficio. Un giorno ho comprato delle graffette e ho iniziato a fare sculture. My encounter with paper clips was very casual. When I was living in Bologna, I lived above a small store that was selling school and office supplies. one day I bought some paper clips and started to do some sculptures. *Ho iniziato a fare questo tipo di sculture nel 2002. I started making this kind of sculpture in 2002. DDoA: Quale era la tua prima opera di sculture usando le graffette? 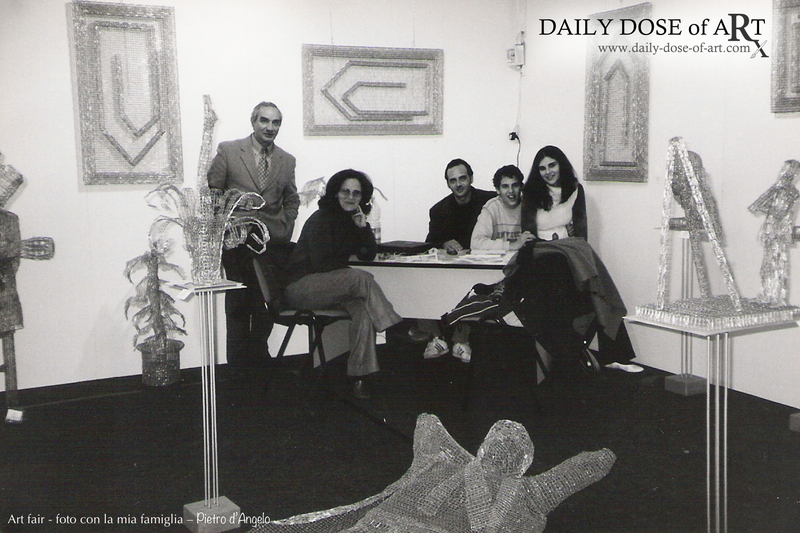 What was the very firstpiece/sculpture that you made using paper clips? PdA: La prima scultura che ho realizzato è stata una testa per un esame di scultura in accademia. Quando il professore la vide mi disse che avevo fatto un buon lavoro e che entro la fine dell’anno ne dovevo realizzare una grande per l’esame finale. Così realizzai la mia prima scultura di graffette: una donna che spingeva un carrello per la spesa del supermercato con alcuni prodotti dentro e con una bimba seduta dentro. The first sculpture I made was a head for an exam in sculpture in the academy. When my professor saw it, he told me that I had done a good job and that at the end of the year, I would need to do something greater for the final exam. And so I executed my first sculpture using paper clips: a woman pushing a shopping cart containing some items and with a baby seated in the cart. DDoA: Come inizia un’opera? Parte dagli schizzi or dai modelli in vivo? How does it all start? 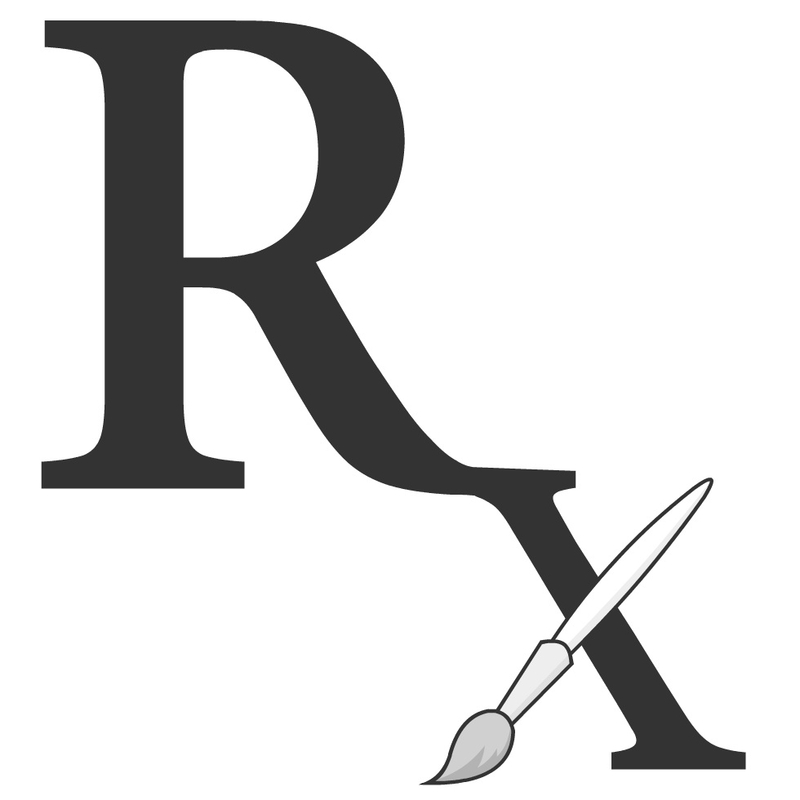 Do you work from drawings/live models? PdA: Di solito non realizzo schizzi ma inizio a lavorare direttamente seguendo l’idea che ho in mente. Invece realizzo degli schizzi solo quando devo fare dei lavori su commissione per far capire al committente il tipo di scultura da realizzare. Usually I do not use sketches, but work directly from an idea that I have in my mind. Instead, I would use sketches usually when I have to do commissioned works to be able to convey to the client the kind of sculpture that is being made. DDoA: Adoperi le stesse dimensioni di graffette? Prendi nota della quantita’ di graffette che adoperi per un’opera? Do you work with the same size of paperclip? Do you keep track of the number of paper clips you use on a piece? Usually I use paper clips of the same size. The first paper clips that I used were zinc plated, then I used those which were nickel plated. I have also made some sculptures using colored paper clips and now I use stainless paper clips which a company is producing only for me. 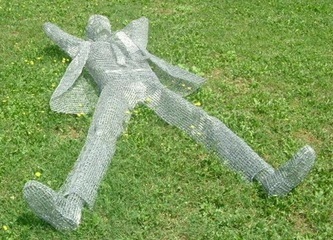 The sculptures with paper clips using inox stainless are very durable and can be exposed to an unprotected environment without rusting. I do not take note of the number of paper clips I use, but i make some estimates considering that I use a box containing 20,000 pieces. I start by cutting, folding and tying together a metal net. I make the various pieces of the work, then I do the assembly. as soon as the net structure is ready, I attach the paper clips to the net. I work using pliers of different sizes and a bolt cutter. DDoA: Quanto tempo occore per completare un opera di graffette? Per esempio, la figura seduta che suona la guitarra dal 2003? How long does it take you to finish one paper clip sculpture? For example the seated figure playing the guitar from 2003? PdA: Il tempo di realizzazione dipende dalla dimensione dell’opera, comuque il tempo di realizzazione varia da 1 mese fino a tre mesi. Fa# (cioè il chitarrista) è una scultura che risale ai tempi dell’accademia a Bologna. E’ realizzata con quasi 25.000 graffette e per farla ho impiegato quasi tre mesi di tempo. The time it takes to complete a work really depends of the dimensions of the work, nevertheless it usually varies between one to three months. 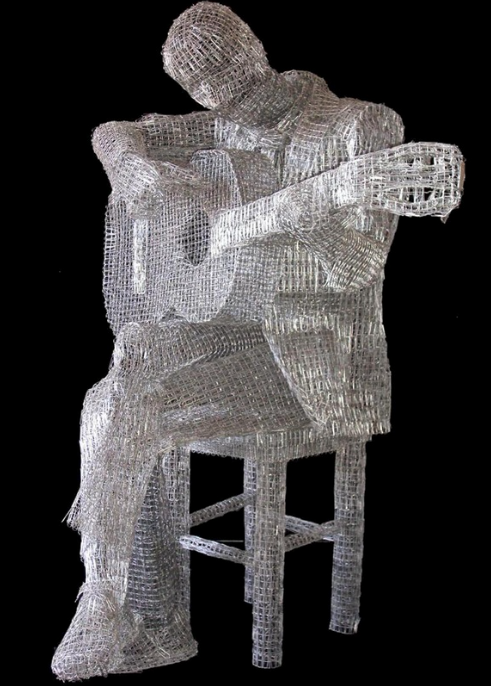 For example, The guitarist is a sculpture that arose from my time at the academy in Bologna. It was made with almost 25,000 paperclips and it took almost 3 months to complete it. PdA: Non riuscirei a scegliere “il figlio preferito” ogni scultura nasce da qualche input che arriva da un dialogo o da qualcosa che osservo e che mi colpisce. Per esempio i bimbi con i fiori sono stati fatti nel 2013 periodo in cui in Turchia vi erano una serie di manifestazioni che hanno avuto origine da un sit-in di una cinquantina di persone che manifestavano contro la costruzione di un centro commerciale al posto del Parco Gezi a Istanbul. In queste sculture il fiore è colorato proprio per amplificare la sua particolare rispetto al bimbo che lo tiene in mano. I can’t say I have a ‘preferred child’ since each sculpture is born out of some input that descends from a dialogue or something that i observe or that catches my attention. For example, the children with flowers were made in 2013 during a period in Turkey when there was a series of demonstrations that originated from the sit-in of some 50 persons who protested against the construction of a commercial center in place of the Gezi Park in Istanbul. In this sculpture, the flower is purposely colored to amplify its peculiarity in relation to the child who holds it in his/her hand. DDoA: Potresti condividere delle cose che hai imparato attraverso il tuo lavoro con le graffette? non solo nel ambito dell’arte ma anche i significati per la vita in generale. Can you share some things you learned from working with paper clips that applies not just your art but to life in general? PdA: È un lavoro divertente che mi sta dando la possibilità di viaggiare, di conoscere tanta gente che come me ama l’arte. Ho anche fatto delle mostre con alcuni artisti che studiavo nei libri, così ho avuto la possibilità di conoscerli anche a livello umano e ho imparato tanto da loro. I find my work enjoyable. It also allows me the possibility of travelling, and getting to know many people who also love the arts. I have also been able to do exhibitions with other artists whom I had only previously read about in books and thus have had the possibility of also getting to know them at a human level, and have learned so much from them. DDoA: Che messaggio voresti communicare tramite le tue sculture di graffette alla nostra societa’ d’oggi? 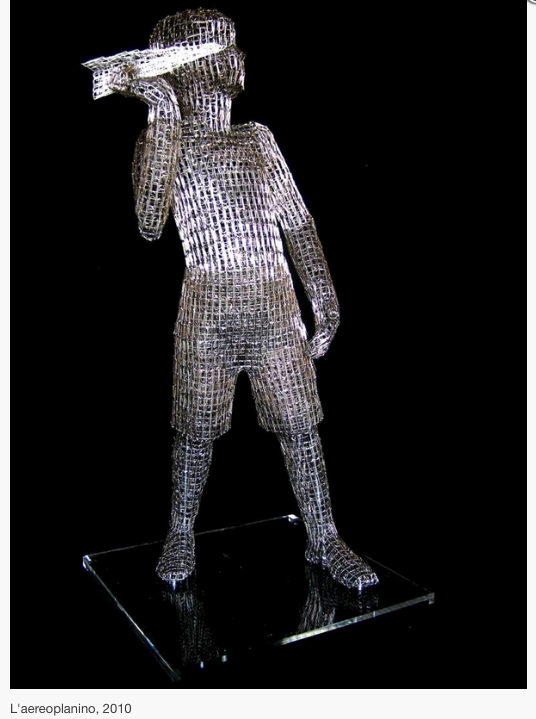 What message do you want to send across with your paper clip sculptures to today’s society? PdA: Io amo la natura, le piante, gli animali, quando realizzo i miei lavori io prendo ispirazione da essa. 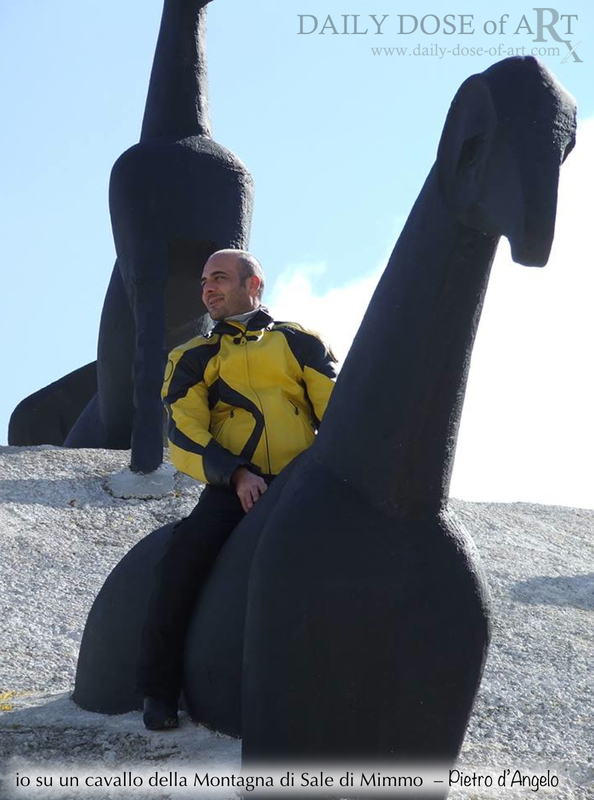 Le mie sculture pur se sembrano fredde e grigie si propongono di instaurare un dialogo con la natura, per ricordarci che il contatto con essa è importante. Un altro messaggio che cerco di trasmette riguarda il lato infantile delle cose, nella serie che ho realizzato con solo sculture di bambini, ho voluto far comprendere che la creatività, la spontaneità e la dolcezza d’animo tipica dei bambini non dovrebbe mai abbandonarci. I love nature, plants, animals and when I create my art, I take inspiration from them. My sculptures, while appearing to be cold and grey, propose to establish a dialogue with nature – especially to remind us that this contact with nature is important. Another message that i endeavour to convey is regarding the “childlike” aspect of things. In my child sculpture series, I wish to convey and create an understanding that creativity, spontaneity, sweetness of the soul- traits typical of children- should never be abandoned or forsaken. Una graffetta e’ uno strumento usato per tenere assieme fogli di carta, ma come vedo dalle tue sculture, esprimi un senso di individualismo (per esempio, una certa liberta di esprimire la persona che veramente sei, nel ambito del tuo spazio ed unicita’. Grazie per quello che hai scritto, sei riuscita ad esprimere con le tue parole la poetica del mio lavoro. Thanks for what you have written; you have been able to express with your words the poetry of my work. So do… as Pietro d’Angelo has done – explore the different possibilities of your creative expression. 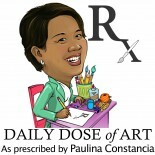 Enjoy your art process and life journey; learn from the people you meet along the way. This entry was posted on September 26, 2014 by Paulina Constancia in Create, Explore and tagged Creative Professionals, sculpture.